Oct. 17, 2012, State Collge, PA - It appears that, after an extremely warm winter last year, cold weather will be making a comeback this year in Canada. According to an AccuWeather.com release, the Atlantic and Maritime Provinces will be the one exception to receiving colder weather, but winter storms won't leave them completely alone. Ontario and Quebec should have a return of winter status quo with near-normal temperatures and snow said the release, but the Prairies will experience slightly colder weather and Alberta and British Columbia will experience a chilly and drier winter. "For Saint John's and Halifax, we do expect a fairly stormy winter, especially from January through February, a number of coastal storms, I believe, will be coming up in those areas," AccuWeather.com Expert Senior Meteorologist Brett Anderson said. "Once we get into the second half of January and February, I believe we are going to see a stronger storm pattern coming up from the south and also some cold air getting tapped from the north. So, I believe we may be actually seeing above-normal snow for places such as Toronto, Ottawa, Montreal during the heart of the winter," Anderson explained. 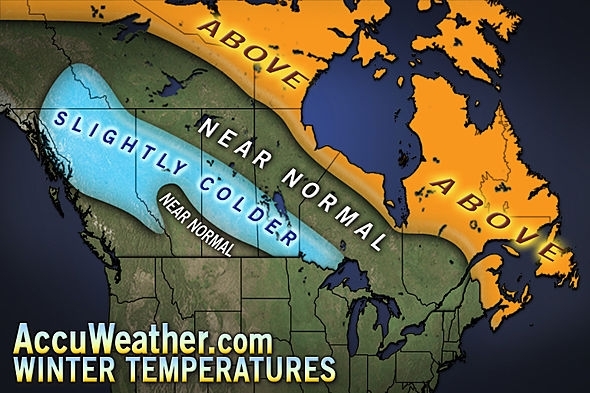 For more information on the expected 2012/2012 winter temperatures in Canada, please visit AccuWeather.com. Is there surplus land for bioenergy?